Team Registration is a way to save some money on registration, and bring some friends, family, and colleagues along for the fun! New for this year will be a friendly team competition so that you can encourage those on your team with a little extra incentive. The process is easy. You don't need to register everyone at once and it only takes six people total ​to make a team. 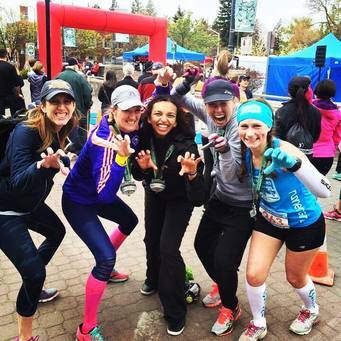 If you're joining the Bend Marathon as a team, Congratulations! The process is easy. You don't need to register everyone at once and it only takes six people total ​to make a team and each member saves $5. A team captain will make a team through the online process, select a team name, and get a password that can be given to other runners to sign up under that team. Once that 6th person registers for your team, everyone will be refunded $5. Anyone registering over that original 6 will automatically get the discounted rate. 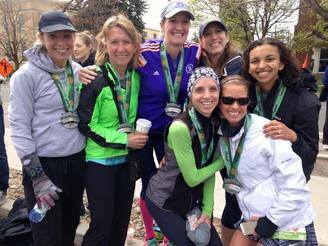 We hope you'll enjoy your race day even more by having a group to meet up with, run with, or cheer at the finish line. If your team didn't quite meet the minimum number - no worries, you still get to have a fantastic race. We've got lots of goodies to make your day special -- starting with a beautiful course, a great race shirt, and a fantastic medal, Humm Kombucha, and a Deschutes beer waiting for you at the Finish Party! During registration, as soon as you "Choose Your Event", click the button labeled "TEAM REGISTRATION" and select Create New Team Registration. You'll be asked to select a Team Name and Password. Just like that, you're a Team Captain! Recruit at least 5 other people who haven't registered yet, give them your team name and password. Once the 6th person registers, everyone on the team will be given a $5 refund! Receive your Team Name and Password from your Team Captain. During registration, as soon as you "Choose Your Event", click the button labeled "TEAM REGISTRATION" and select Join Existing Team Registration. Select your Team Name from the drop down menu, enter your Password. DONE! You will receive a $5 refund when a 6th person joins your team. But why not help a Team Captain out and help recruit for the team! Team members do not have to register for the same distance for the friendly competition to work. We'll have a little fun and see which team comes out on top. Minimum team size is 6 people, and the more team members the merrier - everyone gets $5 off! Recruit a team of 25 and the Team Captain gets their registration FREE! Your registration will be refunded once your team size reaches 25. ​Participants must join your team at the time of their registration. They can't join retroactively. Team Captains can check who is registered for their team on RunSignUp's Team Registration page. Deadline for all team registrations is 4/10/19, 11:59 pm. What if I don't get 6 people on my team? If you have fewer than 6 people on April 9th, we'll send an email to the Team Captain and all team members to let you know that you have 24 hours to complete your team. If you don't have 6 people on April 11th that's ok, you still get to have an amazing race with the support of everyone around you.